Strangely enough, the story of Japanese trowels and exquisite plastering begins with tea and fire. Between the 9th and 13th centuries, Buddhist monks brought tea seeds from China to Japan and in the 16th century, Zen practitioner Sen no Rikyu, established the tea ceremony. The tea ceremony generally takes place in a chashitsu, or tea house. More than 400 years ago, Sen no Rikyu plastered the walls of his tea house with local, native soils, and forever changed the course of history. To this day, following the Japanese aesthetic of "wabi-sabi", the unostentatious walls of the chashitu are plastered with earth. As the tea ceremony and the construction of tea houses spread throughout Japan, the art of Japanese earthen plastering flourished. Unlimited time and resources were granted to craftsmen to create unpretentious, but exquisite earthen plastered walls. In this way, tea and the Japanese aesthetic led to the high development of fine earthen plastering in Japan. Like many traditional societies, in Japan, fire was something to be feared and awed. Since most traditional Japanese buildings consist of a wooden structure, the danger of fire was ever present. In order to safeguard valuables and food rations, thick earthen plastered storehouses were built. The massive earthen walls of these buildings protect valuables from fire and food stuffs from rodents and temperature extremes. However, Japan also experiences high precipitation. In order to protect the earthen walls from weathering, storehouses were often finished with a thin coat of Japanese lime plaster . In a sense, the fear and awe of fire led to the development of massive earthen plastered walls in Japan, and high precipitation led to the development of fine Japanese lime plastering. 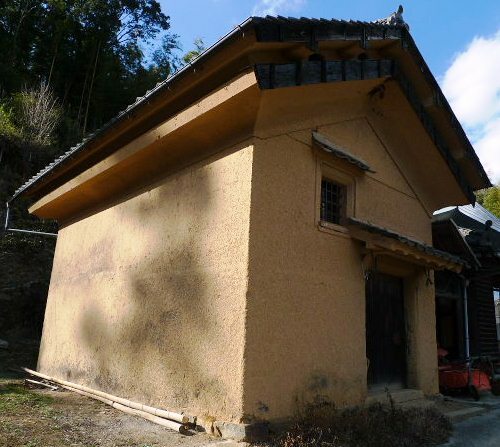 Through tea and fire, we see two streams of natural plastering in Japan, fine finishes to be appreciated and functional massive earthen walls for protection. Copyright © 2015 KIWADO All Rights Reserved.